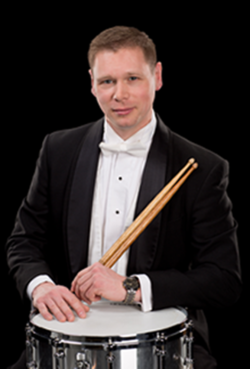 Dr. Steven Owen is a timpanist, percussionist and drum set artist, currently with the “President’s Own” United States Marine Band in Washington, DC. He earned his Masters in Music, Doctorate in Musical Arts, and the prestigious Performer’s Certificate from the Eastman School of Music. While at Eastman, Dr. Owen served four years as the Music Director of the Eastman Chamber Percussion Ensemble, performed on two Asian tours as Principal Timpanist with the renowned Eastman Wind Ensemble, and was featured as a tour soloist in 1998 in the world premiere of the wind ensemble transcription of Joseph Schwantner’s Concerto for Percussion. Additional concert tours have taken Dr. Owen to 49 of the 50 states, as well as to Europe. His recordings include percussion and timpani on the Eastman Wind Ensemble 50th Anniversary CD and two releases with the Rochester Philharmonic Orchestra. He also played drums and percussion on “Building a Monastery” by singer/songwriter Doug Mattingly. He recorded numerous CD’s with the Marine Band and many others. In addition to maintaining an active performing schedule, Dr. Owen cultivates his passion for teaching. During his many national concert tours he has sought every opportunity to work with students of all levels, from conservatory music majors to inner city school children. Dr. Owen was author and performer on “The Complete Percussionist” educational DVD that has become a mainstay in school music programs throughout the country. He has given master classes at Eastman, Florida State University, Syracuse University, Auburn, Kansas University, The University of Oregon, The Armed Forces School of Music, Tanglewood, two Percussive Arts Society International Conventions (2008, 2012), and others. Dr. Owen’s students have been accepted to The Juilliard School and the Jacobs School of Music at Indiana University. Locally, Dr. Owen performs with the Marine Band’s chamber orchestra, concert band, jazz combo section, as well as on the chamber music series. Dr. Owen has appeared with the Maryland Symphony Orchestra, National Philharmonic Orchestra, and the Annapolis Symphony Orchestra. This page was last modified on 22 May 2015, at 15:34.